TP-LINK's Archer T9E comes with the next generation Wi-Fi standard - 802.11ac, 3 times faster than wireless N speed. With 1300Mbps wireless speeds over the crystal clear 5GHz band or 600Mbps over the 2.4GHz band, the Archer T9E is the superior choice for seamless HD streaming, online gaming and other bandwidth-intensive tasks. The 5GHz 1300Mbps is perfect for HD video streaming and lag-free online gaming, while using 2.4GHz 600Mbps Wi-Fi for normal use such as web surfing. 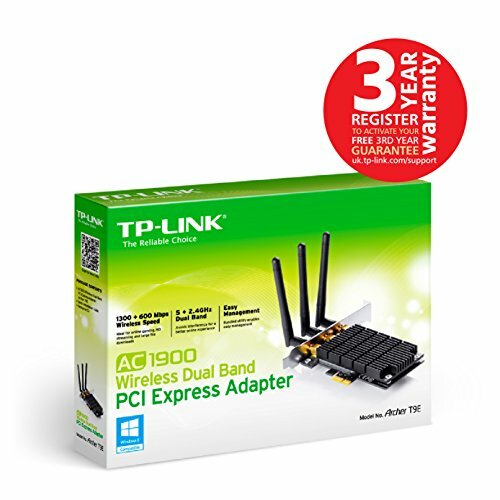 TP-LINK's Archer T9E is an AC1900 Wireless Dual Band PCI Express Adapter, giving users the ability to access crystal clear 5GHz connections or legacy 2.4GHz connections to upgrade their PC's wireless capabilities to operate with new 5GHz band wireless networks, while ensuring that they can still access legacy 2.4GHz band wireless networks. Archer T9E utilizes beamforming technology to receive more directional Wi-Fi signals for improved performance. 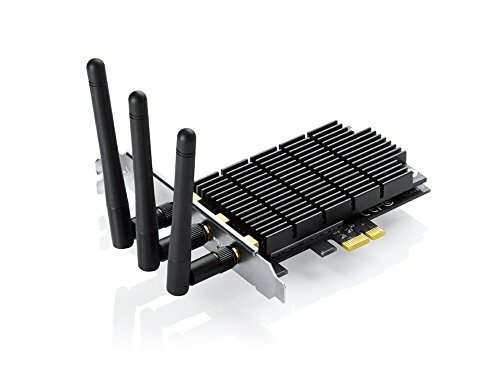 At first, I chose the PCE-AC68 wifi adapter from Asus but it didn't work for me. The wifi keep dropping after 30 mins. After days of frustration, I finally pick the TP-Link Archer T9E and it work stable and fast. Works well under windows 10 with a driver update. Make sure you download it before hand. Was quite excited to test this card out but I was disappointed quickly finding out after I purchased this that unlike the ASUS AC68 this card will not see the Higher Channels of my AC3200 Router. So on the lower channels I get reasonable throughput but not what I should be, as the lower channels are more congested from the other lower end AC WiFi devices. only getting 400Mbps in one room away with these channels. The Intel Wireless-AC 7260 in my media PC in the same roon gets 400Mbps on the lower channels but on my higher channel on my router it gets its 867Mbps and out performs this card, very bad design by TP-Link next time ill pick up the ASUS AC68. Possible Firmware fix as is uses the same Chip as the ASUS but none have been released. My Router is a D-Link DIR-890L. Very easy installations, Windows needs a driver so make sure you download it before going wireless. This was a later addition to my build, so far seems good - although it did randomly drop out once in Windows 10 not long after install but hasn't happened recently. Funnily enough, it worked natively in my El Capitan hackintosh install, however it needed me to download the drivers from manufacturer website in Windows 10. Quite ironic. Regardless, it has better wifi reception than my Macbook Pro. Would recommend. This is a great wireless card. Almost no difference between this and wired for downloads.. Uploads are lacking compared to wired however. Works fine for wireless. Just make sure you have drivers pre-downloaded. Looks nice to. Very good adapter. Looks good. Doesn't have a long cable. Works great with solid specs. Works with Windows 10. Don't buy if you don't have a good internet connection and router. Better off with the cheapest ac adapter, if that is the case. 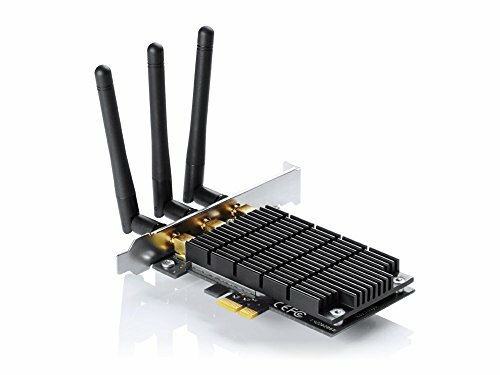 Compatible Wi-Fi card for macOS and is plug and play with Linux as well. Had to download drivers from TP-Link website for Windows though.